Rossvale were left to rue a hugely controversial refereeing decision as they went down 2-0 to Championship leaders Rutherglen Glencairn. Vale had begun the game brightly with Gary McMenamin crashing a fifth minute header off the underside of the Glencairn bar. At the other end Dale Simeon missed a glorious chance as he mishit his shot straight to Jamie Donnelly. But in the 15th minute came the decision which changed the game. Matt Niven’s shot appeared to cross the line before a defender cleared but the referee - who had the run the match himself after one linesman failed to appear, waved play on, much to the disbelief of all. With Rossvale stunned Rutherglen picked up their and Jordon Lyden’s cross was headed narrowly over by Simeon. 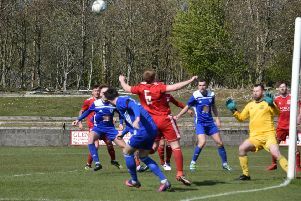 But the opener came when ex-Vale man Jay McKay dashed into the box and his cutback was turned into the net by Simeon. Glens were now well in charge and unlucky not to go further ahead just before half-time when Derek Esplin blasted over from 16 yards. Right after the break Leyden burst down the right and his cross found McKay unmarked in the box but he failed to connect. 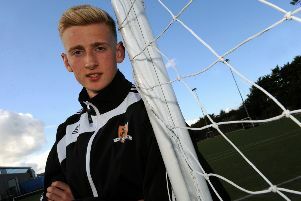 Simeon then set up another chance for McKay, who blasted wide, and another ex-Rossvale player, Craig McGregor, sent a header from close in flashing over the bar. But game was finished as far as ‘Vale was concerned on 64th minute mark when Stephen Kerr came up for a corner and was left unmarked at the back post to head home. Vale just couldn’t break down the Glens defence and the game slipped away from them. But promotion is still in their own hands and they will look to bounce back quickly, away to Irvine Victoria this Saturday. Before Saturday’s match both teams participated in a minute’s applause to ex-Rossvale player Anton Houghton who passed away during the week.